Controversial plans for a supermarket in a Devon town have been thrown out. Permission for a Tesco store in Torrington has been refused but the green light has been given for a smaller store run by Somerfield. 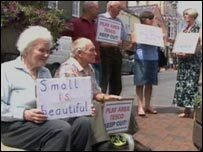 Residents protested against Tesco's original plans for a 30,000sq ft store, saying it would result in the destruction of local facilities. A 40% smaller store was then proposed for Vicarage Field but this was refused by councillors. Planners at Torridge District Council said the decision was made after they focused on the size of the schemes. They assessed the knock-on effects to local businesses, as well as seeing whether the land to build any of the planned stores was actually available. Tesco's original plans were for a site that is currently a football ground, swimming pool and children's play area. Some locals protested, saying it would cost the community vital facilities and cost more local jobs than it would create. Tesco's second plans, drawn up after an extensive public consultation, would have been on the site of the football ground. The pool and play area would have remained and Tesco offered to move the playing fields to another site, as well as provide a new clubhouse and a 200-seater stand. However, Somerfield's scheme was for a brown field site near Vicarage Field. About 100 people attended the planning meeting on Thursday at the Howe Concert Hall on Castle Street. Somerfield said it was delighted at the decision while Tesco said it was disappointed by the move and was assessing its options.